Universe at Pan-Pagan Festival in Indiana, 1980. The name is sure to be startling, and may seem eccentric. The Society for the Prevention of Witchcraft Being Called Wicca sounds rather like something Monty Python would have cooked up in their classic comedic cauldron, had they been Witches  no doubt to join the immortal ranks of their deliciously droll Ministry of Silly Walks and Royal Society for Putting Things on Top of Other Things. Come to think of it, Witchcraft (or some delightfully unreasonable facsimile thereof) has, on occasion, actually played a part in Pythonesque proceedings. To wit(ch): the infamous scene in ...Holy Grail in which a dim-witted villager overeagerly affirms that an accused woman facing imminent burning as a Witch turned me into a newt. Even he manages to realize his own absurdity a moment later, admitting (with superb comic timing on the part of John Cleese) that he got better. But  now for something completely different. Our Society name is indeed intended to be playfully provocative, but its cause is no joke. Since our founding in the early 1970s by Lady Isadora, we have provided a very real, factually-based, and thus in our view absolutely legitimate (if not exactly comfortably Pagan-PC) challenge to a widespread but etymologically incorrect usage caused by decades of misinformation and rote repetition. As such, the Society is, by its sorcerously subversive Wicca-status quo-challenging very nature, sure to step on a few big-buckled, black-booted pointy toes. Were afraid we cant help that. The truth of a matter is not always easy nor convenient, but it still needs to be faced. Too controversial? Too comfort-zone-stretching? For Witches, it shouldnt be. Weve endured worse, far worse  we can take it. It shouldnt be that big a deal for us to have a frank and open dialogue about something like this. Since when did real Witches ever become tame, tiptoe-through-the-tulips tenders of the shrine of any sort of officially correct, completely Crone-free Comfy-Cozy Goddess, anyway? PERISH the thought! The fact is, contrary to the impression one can get all too easily from far too many books on modern Witchcraft, aka Wicca, which have regularly been in use in recent decades  books which are often otherwise quite enjoyable or worthwhile  solid documentation has existed all along that the original Old English word for Witchy practice or activity wasnt Wicca (wizard, male Witch), but Wiccecraeft (pronounced WITCH-eh-creft). Proof of this is readily obtainable in grammar books or standard dictionaries of Old English, also known as Anglo-Saxon  a Germanic, not Celtic, tongue. As any number of linguistic scholars would agree with no hesitation whatever, there is nothing remotely controversial, arcane, or lost in the mists of time about any of that. The original meaning of the older stem wic- is sometimes debated, to be sure. But Wiccecraeft was Old English for Witchcraft, period. Therefore, at the very least, this information deserves to become common knowledge among modern Witches  whatever names we end up deciding to use nowadays for our Craft . We in the Society take pains to affirm that, despite our forthright, correctively Cronish, and admittedly somewhat curmudgeonly title and presentation, our intentions are good, our cause high-minded and just. Were willing to have a sense of humor about the matter, and we sincerely hope others will be willing too. Of course, we dont really think we can prevent anyone from calling Witchcraft Wicca who truly wants to do so. The choice is entirely yours. (Lets face it, any Christian can also call Christianity Male Christian if so inclined  and that would be equally perplexing!) What we would like to prevent is the continued widespread rote repetition of totally incorrect information about the Crafts name origins, or the completely unnecessary speculation about same. This state of affairs has long inspired far too much fuzzy fantasizing not infrequently billed as fact in our community. In the final analysis, modern Witches are very badly served by such poor scholarship, or lack of it. We in the Society are unabashed cauldron-stirrers, and proud of it, well never deny. All things considered, controversy cant help but be our middle name, and probably even our first and last names, as well. Please consider why. It is seldom if ever possible to draw attention to a cause, or effect any radical, real, and lasting change in it, by being politely unobtrusive or wildly UNzealous about it, after all  especially when representing such revolutionary ideas as we do. If, indeed, one can call the long overdue embrace of etymological and historical accuracy revolutionary. Must we, really? Esteemed Brothers and Sisters of the Craft, we can but ask for your open-minded consideration. 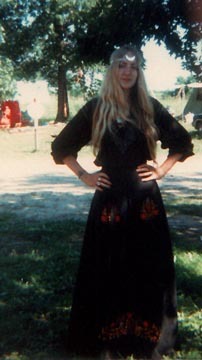 Please read Lady Isadoras essay You Say Wicca and I Say Witchcraft. (Note: One of Isadoras specialties is the studious pursuit of the Celtic and Germanic branches of the Indo-European language family tree. While at university, she was inducted into Delta Phi Alpha, the National German Honor Society in the United States, having won a number of academic awards in that language, including two from the German government.) We hope youll find her article entertaining, challenging, and informative! But whatever the extent of your prior knowledge of this subject, and whatever you decide, or have already decided, about your own Witchcraft name usage, we think youll agree: knowledge is power. Please take the truth, and pass it on! Watch this page for more info coming soon about pamphlets, T-shirts, and Society activities! Lost in the Ladys Labyrinthine Lair? Visit the Site Map!